With so many machine made tiles in the market, each tile of this exclusive line is different & is truly a work of art! 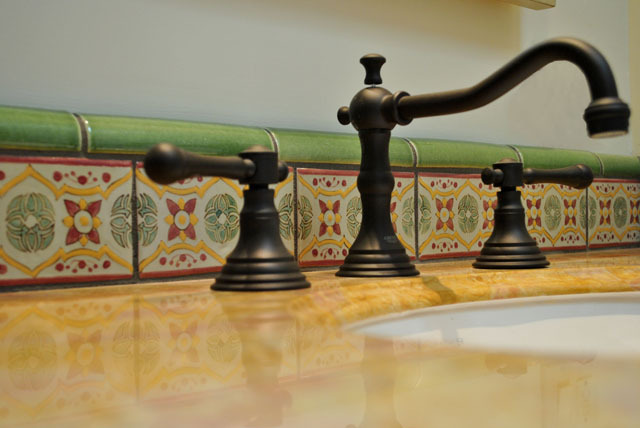 Handmade Talavera tiles began its production dating back to the 16th century. The process of creating this handmade tile is unique in a way, in which certified tile artists mix clay with their feet. The clay is formed into pieces and placed into molds, then fired. Once the tiles are glazed and painted, they are fired once more to guarantee its quality. The colors used applied throughout these tiles are made to reflect distinct representations, in respect to the different cultures. The applications for these tiles are endless - from stair risers, accent walls, showers, backsplashes, fireplaces, to fountains. These tiles will offer an authentic, yet vibrant look into a space. M.A. Tile & Stone Design is featuring a few new boards in the showroom that offers the ability for customization. These fun designs can be done in any color or finish that will work for your projects. 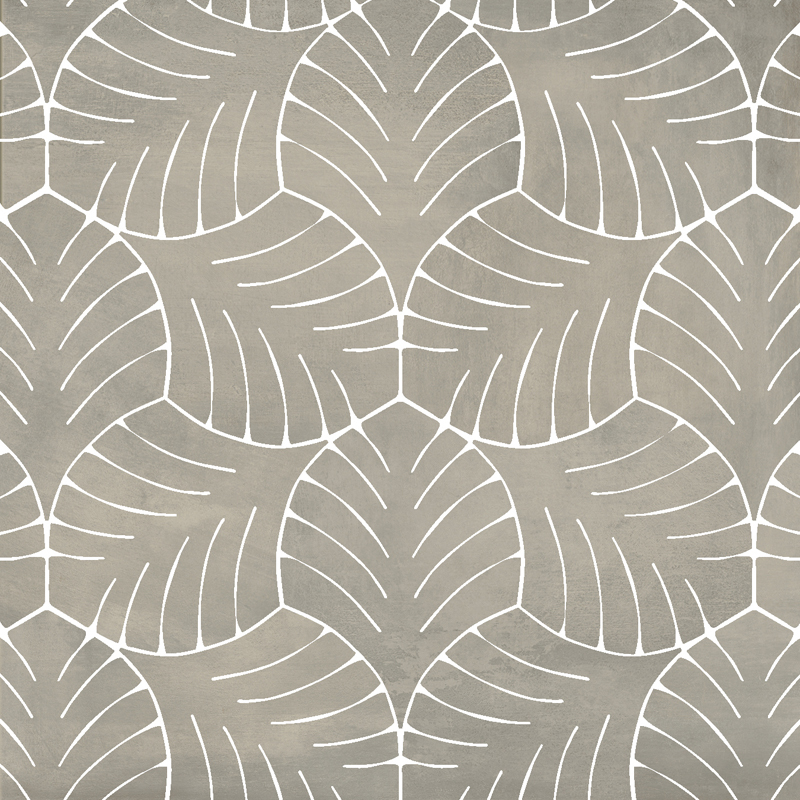 From left to right, we carry the patterns: Diamante (Concetta Bianca & Grigio Scuro), Hexbrick (Bianca Marea), and Foliage (Eastside Clay). These intricate, yet subtle designs will definitely capture the eyes of your clients in their space. Lead times for these patterns can range from a minimum of 2-4 weeks. Stop by the showroom, and check these boards out in person! Here at M.A. Tile and Stone Design, Inc., we pride ourselves in the uniqueness of our tile selections. This particular collection that we carry is handmade, aesthetically pleasing, durable and environmentally safe. Behind the scenes, there are about 20 local artisans who design these timeless pieces. Together, creating these tiles benefits their local community artistically, economically, and environmentally. There are over 100 colors that are brushed by hand in the finishes of matte, gloss or metallic and crackle, therefore you may see some color variation on certain tiles. We also love the simple dimensionality and depth that these tiles offer. To make this possible, artisans cut and press these unique shapes by hand. These tiles may be installed as wall applications in showers, bath surrounds, fireplaces, backsplashes, accent walls, or pools! New Concept Boards Are Here! M.A. Tile & Stone Design, Inc. loves getting fresh concept boards at the showroom! Here are some boards that we have ordered, and is on it's way over! These boards come from a collection by KJ Patterson. KJ Patterson has expanded their company with these fun new encaustic tile designs, as well as improving their lead time to 4-6 weeks, from the time of order. 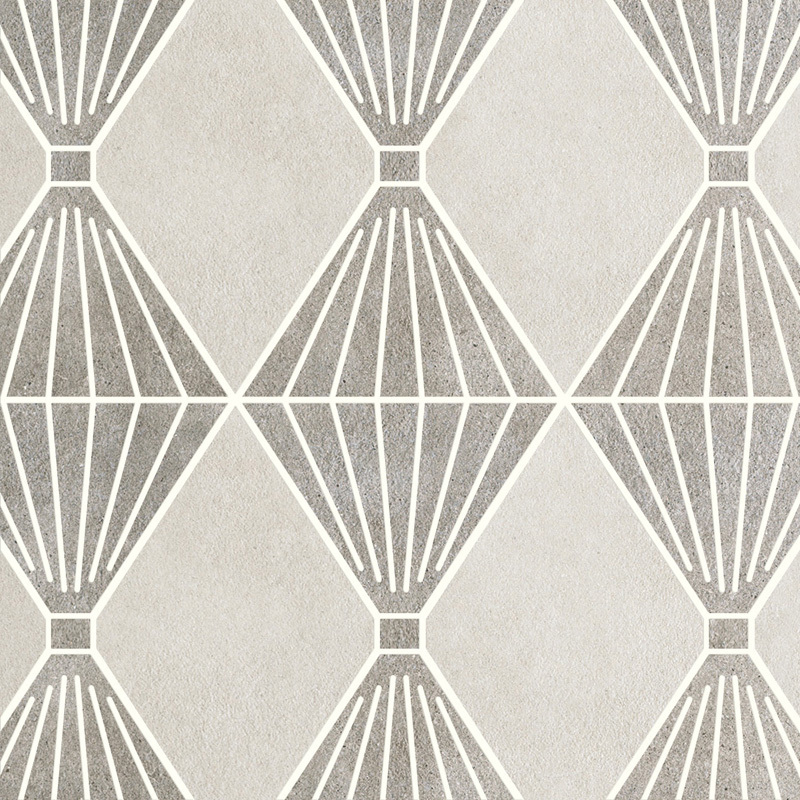 The applications for these encaustic tiles are endless, residentially and commercially. Installations are suitable for indoor and outdoor use such as: wall or flooring for kitchens, bathrooms, showers, stair risers, accent walls, patio floors, fountains and pool water lines. You may customize any of these patterns to match your project from the choices of 23 inlay colors and 4 color body colors. These encaustic tiles are a great way to mix tradition with a modern twist, by giving you the freedom of creating unique pieces into your projects. 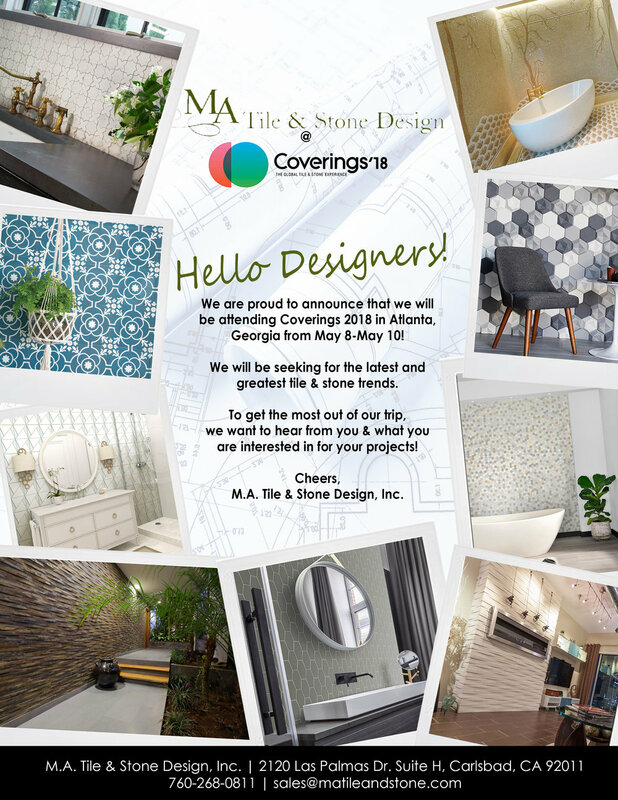 We are excited to announce that our president, Mary Anne, and design consultant, Mariel, will be attending Coverings 2018 at Atlanta, Georgia from May 8 through May 10! Coverings is the largest tile and stone show in North America with over 1,100 exhibitors from all over the world. This show will cater to architects, designers, distributors, retailers, builders, remodelers, contractors, installers, and fabricators. This event will give us the opportunity to learn more about the new and upcoming products that our partnered vendors will be manufacturing within this year. We will also be looking out for tiles and stones that we believe will best suit our clients. Within the next couple weeks, what we ask from our lovely clients, are for some feedback on what you want to see in our showroom. Either visit, email, or call us if you think we can find something that you'd like, during our visit!